Hi ladies! How does it feel being back at work after the festive season? I'm so tired for some reason so I’m struggling! I have a very quick NOTD for you using one of the polishes that has been on my wishlist for a very long time - Color Club Fashion Addict. It was SO worth hunting down! I’m sure you will have all seen this beautiful polish before so I won’t say too much and just let you admire the holo. Above is 3 coats with no basecoat or topcoat. It applied nicely this way and lasted 2 and a bit days before I got tip wear and changed my polish. It's a real shame the sun wasn't out when I wore it as I wanted to see the holo in all its glory! I didn't have to work on public holiday Monday so the boy and I went to Chatswood to do some browsing and have lunch at one of our favourite restaurants Mamak. After lunch I made a beeline for Lush to see if they had any Xmas gift packs or Snow Fairy left. Jennifer - you got me soooooo addicted to it!!!! I have been using your generous gift ever since I got home and I just LOVE the smell =D They had sold out of the individual Snow Fairy shower gels but they had the Christmas Candy box left which included Snow Fairy and other goodies. They advertised it for 50% off making it only $25 which was already a steal. When I went to pay I discovered there was a FURTHER 50% off meaning I only paid $12.50 for it!! What a huge saving! I love a good bargain and now I have lots of lovely Lush goodies to hopefully see me through most of the year. I was really tempted to buy another box but I’m trying to be good meaning no “backup purchases” no matter how cheap as I usually end up not using them. I suggest you hurry along to your nearest Lush and see if you can score a bargain too! On another note, I can’t believe I’ve posted practically every day for over a week! That’s the beauty of holidays ;) I hope to blog more often this year as I won’t be doing any postgrad study. I’d like to start doing nail tutorials and also more reviews. I got a lot of requests for tutorials, reviews and hauls when I asked for suggestions in my last giveaway and I’d love you to let me know exactly what you’d like to see on my blog. Did you like the format of the mini tutorial I did on how to use Liquid Palisade in my last post? Is there anything specific you’d like a tutorial on or that you’d like me to review? I’m not confident enough with my makeup skills to show the world unfortunately =S I can’t guarantee I can fulfil your requests but I will try my very best! I love that glittery, hologram polish. It's all sorts of amazing. The lush pack sounds like the BOTD - Bargain Of The Day. Hahahaha I'm such an idiot. Seriously though I love deals that work out like that at the cash register! ooo love the lush box!! and the nail polish is gorgeous ..very sweet and girly!! Gorgeous polish 'Chelle!And you're so lucky for having lush there! Stunning polish! 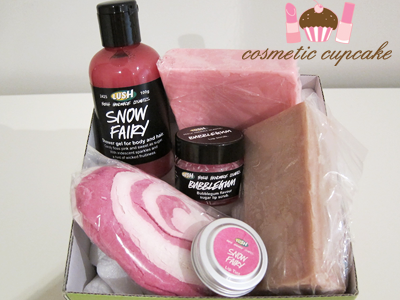 And that Lush gift box looks divine: I once stayed with a friend who had Snow Fairy and it smelled so delicious I wanted to stow it away in my luggage to take it home. WOW that's a really good bargain on lush! :) I was just there two days ago buying Lemony Flutter with a gift card I got for Xmas. The SA was all "our holiday gifts are on sale!" but I wasn't really hearing here over the excitement of getting LF. Everyone loves a bargain! I'd really like to see some of your tutorials. I'm really impressed with yr collection! Best wishes for you in this new year. Very pretty! I know what you mean about being tired, especially after such a long holiday season!! Aww please do tutorials hun, that would be incredible! I popped into LUSH the other day & the same thing happened to me! Don't ya love it when that happens? :) I managed to nab the yummy gingerbread tin. Btw the Honey I Washed the Kids soap is incredible, I use it in every shower & its smells soo yummy! :) Love the nail colour too love, picked up a GOSH polish today in Holographic, really similar n sparkly. Can't wait to use it! glad you liked Snow Fairy Michelle!!! 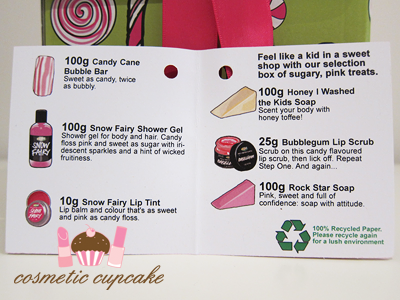 the candy box is so pink and girly <3 that's such a steal!!! Isn't she a great holo? I want to stamp with he rnext week. I'm so jealous of your Lush goodies!! @Mez: Fashion Addict is definitely all sorts of amazing! It was so hard to track down and I can see why it would be sold out everywhere - it's just so gorgeous! LOL I think it was my Bargain of the Week!! @Steph xox: The packaging is so nice I don't want to use the products! @Ria: Us Aussie girls are VERY lucky we have Lush here considering we don't get a lot of other brands. @Danielle: Fashion Addict is definitely stunning! Lol I would have wanted to steal her bottle too don't worry =p After I use the gel the whole bathroom just smells so yummy and I want to shower again haha. @Joan: I didn't know until I was at the cash register! I don't think they're advertising the extra 50% off. @Rachel Marie: That's very understandable, Lemony Flutter is just so awesome! And it's forever out of stock too. @KcomeKarolina: Happy New Year to you too. @Antoszewskia: Glad you like the colour! @†any: Thank you so much for supporting my blog! I'm so glad you enjoy reading it and I hope you continue to =) Happy new year! @나니 : I couldn't agree more! @PinkOrchids: I thought I would be all nice and rested but I guess not lol. @Aysh: Oh lucky you! The gingerbread tin looked so cute in pics I saw. 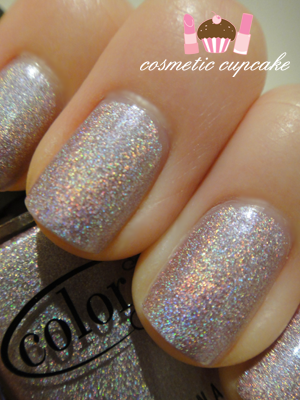 GOSH holographic is such an awesome polish, it's on my wishlist! @Sharon: The bargain totally made my day! You can see a list of Lush stores here: http://www.lush.com.au/catalog/info.php?page=whereislush. I bought it from their Chatswood store but normally I go to their QVB store as I don't live close to Chatswood. Unfortunately QVB doesn't have any of the Christmas Candy boxes left though, I went past on Tuesday and they only had a limited number of gift sets left. @Antoszewskia: Thank you so much! @Beauty addict: I only started getting in to Lush products last year and I must say I'm hooked now! Why didn't I get into it earlier? @Jennifer: You know I can't pass up a good bargain ;) I've used up half the bottle of Snow Fairy you gave me already so I'm trying to not use it too often lol. It's just too yummy!!!! !